If you are looking perfect book about perfect life- you don’t want my book, because my life and my book are very far from perfection. My book is about how I have survived my childhood and the rest of my life by believing that God will save me one more time. You see, if my life is in danger I always believe that God wants me to survive, nothing can destroy me. But if is my time to die, nothing can save me. I have survived my childhood and the rest of my life by simply believing that I could. I have never lost hope. Never. My book is extention to this blog; and my blog is an extension to my book. 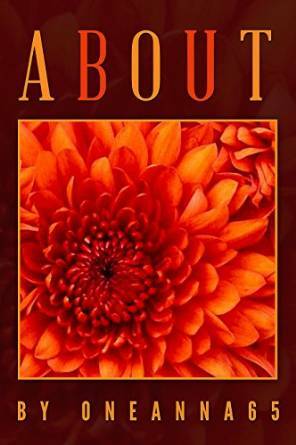 My Book: “About” by Oneanna65 is now available on Amazon as a Kindle e-Book and paperback. Congrats for finishing it! That in and of itself is a huge accomplishment. Congratulations on your book! All you need now is the perfect publicist to get it into the right hands 🙂 I love a great documentary. You convey more strength in one sentence than most people do in all the words of their lives. You are loved and lovely. I read it and enjoyed it too. You are amazing! Thanks! But my are perfectly imperfect… 😀 . Previous Post No more mushrooms for me. Next Post An amazing life.